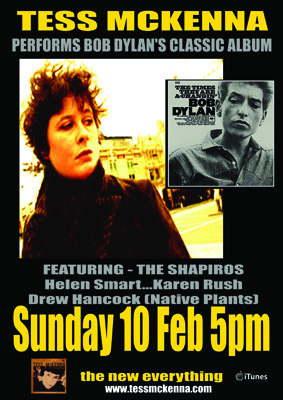 Text: Tess McKenna performs Bob Dylan’s classic album The times they are a-Changin’ – Featuring the Shapiros, Helen Smart, Karen Rush, Drew Hancock (Native Plants). You know how it is, you go to all that trouble to learn all that material, might as well give it another run. I like the way Tess and Bob are giving each other the side-eye in that poster. Come along, it’ll be a blast.